Preheat oven to 350 degrees. Grease two 9” cake pans. In a medium bowl, whisk together the flour, cocoa, salt and baking powder. In the bowl of your stand mixer, cream together the butter, sugar, and vanilla. Add the eggs one at a time, beating well after each addition. Add a third of the liquid ingredients, followed by a third of the dry ingredients, alternating wet and dry and mixing well after each addition. Pour into your prepared pans and bake for 30 minutes, or until a toothpick comes out clean and the tops look firm. Let cool in the pans for 10 minutes, then remove from pans and cool completely on a wire rack before frosting. 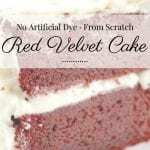 To frost this recipe for Red Velvet cake, I recommend spreading on a thin crumb coat, then placing the cake in the fridge for an hour to let it harden a bit. Remove cake from the fridge and continue frosting. This will prevent red crumbs from mixing with the white frosting.